ApnaComplex Gatekeeper now available in Hindi, Tamil, and Marathi! Right at this very moment, as you read this post, there are thousands of security guards across India using ApnaComplex Gatekeeper to keep the gates of their respective apartment complexes secure. This new update is for all the security staff members! We are extremely proud to release ApnaComplex Gatekeeper in Hindi, Tamil, and Marathi (in addition to English). Security staff can now switch to their preferred language at any point. With the app being available in multiple languages, we aim to make the life of security guards a little easier. We hope that it makes the use of ApnaComplex Gatekeeper effortless and user-friendly with a language they are more familiar with. “A national spirit is necessary for national existence. A flag is a material aid to the development of such a spirit.” -Mahatma Gandhi. With the 72nd Independence Day just around the corner, members of most apartment complexes will be gearing up to organise their own flag hoisting ceremony. The Indian Flag, or the tricolour, is a symbol of our country. As such, it should be treated with great respect. The Government of India has put down the code to ensure its proper construction and handling. Here is a reminder of the dos and don’ts of the National Flag etiquette. The Indian Flag Code specifies the dimensions of the flag and how it should be constructed. This is a measure taken to ensure that the flags used everywhere are uniform. Pick an appropriate size for display. It should be made of handspun khadi, or of cotton, silk or wool. Avoid plastic flags because these are difficult to dispose of. The flag should be split into three equal panels – saffron (not orange) panel at the top, a white panel in the middle and a green panel (described as India green) at the bottom. Be careful with the colours. A navy blue Ashoka Chakra should adorn the centre of the white panel, with 24 spokes that are equally spaced. The Indian flag hoisting rules also cover instances of the flag’s misuse and specify the proper procedure to hoist the flag. During an Indian flag hoisting ceremony, the saffron panel should always be on top. The flag should never be hoisted upside down. It should be displayed from sunrise till sunset, irrespective of weather conditions. The flag should always be positioned to the far right. There should be no other flag or emblem to its right or above it. The Indian flag should hold no lettering or inscriptions of any kind. During ceremonies, it is common practice to use flower petals within the unfurled flag. The Indian flag code prevents the use of any confetti or decorative materials other than flower petals. In a procession, the Indian flag should either be carried to the right or in front of the central line. It should never touch the ground or water. There should be no other flags on the same masthead as the Indian flag. The flag should never be flown at half-mast unless the government specifies. The National Flag should not be used to cover any speaker’s desk, platform or monument. Paper flags can be used during days of national importance. However, care should be taken that they do not touch the ground. The national anthem should be sung once people salute the flag. (It is essential to follow the etiquette specified for the national anthem as well). A damaged flag should never be displayed, and such flags can be disposed of in private, preferably by burning or in a method consistent with its dignity. When planning to hoist the Indian Flag in your apartment complex, it is the duty of every Indian citizen to ensure that these rules are followed. Start a discussion on your ApnaComplex forums to raise awareness among the residents. The managing committee can take things a step further by printing out such rules and handing out copies. It is important to make sure that no misuse occurs, either deliberately or by accident. The tricolour represents the Indian community. So this Independence Day, as you come together in your apartment complex remember to bask in this spirit of community. From everyone at ApnaComplex, we wish you all a Happy Independence Day! Disclaimer: This information is offered as a public service. While we try to make it accurate as possible as on the date of publication, the laws change and more importantly the way we interpret laws could also change. We cannot promise that this information is always up-to-date and correct. We strongly recommend you to always consult appropriate professional advisers for your society to ensure compliance. We are excited to announce “Gatepass” a new capability to make your Apartment more secure. Gatepass allows you to ensure records are maintained for material moving out of your flat or from your society. 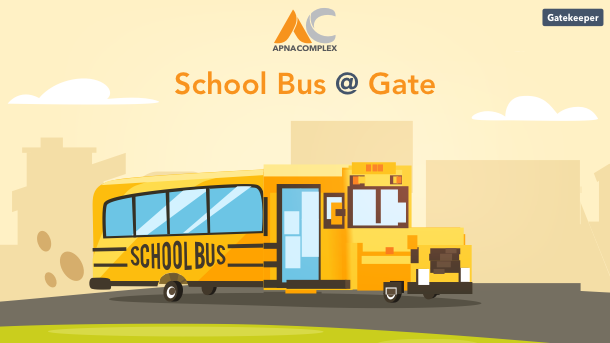 Gatepass is fully integrated with Asset Management and Gatekeeper modules of ApnaComplex making it the most comprehensive solution to track Material Movement from individual flats as well as from Society’s common areas. Residents can create Gatepass for material being issued to Visitors. For example, Gatepass can be issued against a delivery personnel of Amazon to pickup an item to be returned. Residents can create Gatepass for material being issued to Domestic Staff. For example, Gatepass can be issued against the housemaid to carry out news papers. At the time of issuance, one can take pictures of the material against which Gatepass is being issued. The Gatepasses issued by Residents or by Maintenance Staff will automatically be visible to Security Staff on the Gatekeeper. At the exit gate, Security can look up the Gatepass issued against the Visitor / Service Staff, check the material being taken out and mark the Gatepass as used. Benefits of using Gatepass can be felt immediately. More often than not there are no proper records for Society’s assets (such as Motor Pumps, Gym Equipment etc.) that go out of the campus for repair/service. Similarly residents need not issue paper slips and keep calling security to allow material given to their domestic staff. Ensure you have latest versions of the Android and iOS Apps and go to My Unit tab on the app to issue Gatepass. Ensure security has the latest version of Gatekeeper to be able to view and use the Gatepasses. TDS stands for tax deducted at source. As per the Income Tax Act, any company or person making a payment is required to deduct tax at source if the payment exceeds certain threshold limits. Is TDS applicable for Co-operative Housing Societies and Apartment Associations? Yes. Under the Income Tax Act, a Cooperative Housing Society is taxable entity. It is mandatory for any registered co-operative housing society / apartment association to deduct TDS, pay deducted TDS to Government on time, file TDS Returns on time and issue TDS certificates to deductees on time. 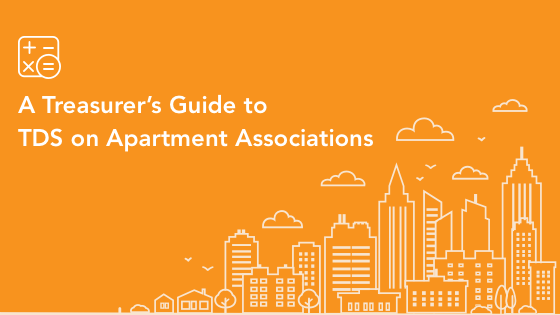 What happens if an Apartment Association does not deduct TDS? If an apartment association fails to deduct tax at source, then the ASSESSING OFFICER has powers to disallow whole of such payments made as expenditure when arriving at taxable profits for such apartment association. For example, ABC CHS paid a single security agency Rs 10,00,000/- during the year and failed to deduct tax on the same, then the Assessing Officer has powers to disallow entire Rs. 10,00,000/- as your expenditure (which means ABC CHS’s “profits” will increase by Rs. 10,00,000/- and Income Tax will be levied on the same). What is amount/percentage to be deducted as TDS by our Housing Society? (a) The nature of services for which payment is being made. Services fall under different sections of IT Act. Section 192 – Payment of Salary As per Slab Rates of the Salary If net taxable income is more than maximum amount which is not chargeable to tax (Rs. 2,50,000 for an individual, Rs. 3,00,000 for Senior Citizens and Rs. 5,00,000 for Super Senior Citizens). You can refer TDS Rate Chart on Income Tax Website for comprehensive list of sections and the latest rates. All these can be easily configured in ApnaComplex Society Accounting module. When should the Apartment Association deduct TDS? TDS should be deducted when (a) Payment is being made to the vendor OR (b) Due date of the Bill raised by the Vendor – which ever is earlier. Can you give some examples of TDS calculations in Housing Society? Example – 1: if a security agency gives a bill for Rs. 2,00,000 on Jul 1st with a due date of July 31st, and the payment is made on Aug 5th – TDS has be to accounted in July itself. Example – 2: if you are paying a painting vendor an advance payment of Rs. 50,000 to begin work on painting – TDS of Rs. 1000 (2% of Rs. 50,000) has to deducted on the date of payment and only Rs. 49,000/- to be paid to the Vendor. Ensure you do not deduct TDS again on the Bill when you receive the final bill from the painting vendor. First Installment – Rs. 15,000 no TDS to be deducted (Total payment during financial year is Rs. 15,000 – which is less than Rs. 30,000 allowed under 194J). Third Installment – Rs. 9,000/- 10% TDS to be deducted on Rs. 36,000 (Total payment during financial year is Rs. 36,000 – which is more than Rs. 30,000 allowed under 194J – TDS needs to be deducted for entire amount of Rs. 36,000/-). It is good practice to deduct TDS with every payment if you are sure that you will have to pay all installments during the year. Should TDS be calculated on the Bill Amount including GST or Excluding GST? Taxes must be excluded for purposes of TDS calculation. By when should we pay TDS to Government and how do we pay the amount? Except for month of March, all amounts deducted as TDS in a given month needs to be paid on or before 7th of subsequent month. For month of March the due date date of payment is April 30th. Non-payment or late payment of TDS will attract interest @ 1.5% per month until the tax has not been deposited. Refer Income Tax Website on How to Pay the TDS deducted to Government online. Challan type 281 is used for TDS payments. Please refer this extensive Do’s and Don’ts to avoid errors while making the payment provided by NSDL. There are different forms to be used for different types of TDS deductions and deductees. For most housing societies and apartment associations, Form 26Q is the most relevant as it deals with all non-salary deductions. Filing TDS is a slightly complex process. We recommend you take professional help from your auditor to file error-free, timely returns as there are penalties and late payment interest for non-filing/late-filing/filing with errors. If you are interested in filing on own, you can refer TDS Return filing manual. What is the due date for filing TDS Returns? TDS returns need to be filed for every quarter. For Apr-Jun quarter – filing needs to be done by 31st July. For Jul-Sep quarter – filing needs to be done by 31st Oct. For Oct-Dec quarter, filing needs to be done by 31st Jan. For Jan-Mar quarter, filing needs to be done by May 31st. Filing TDS returns on time is mandatory for every deductor, failing which deductor will attract late payment fees @ Rs 200/- per day until the return is filed. However, this amount shall not exceed the amount of tax. In addition to this ASSESSING OFFICER may direct the deductor to pay penalty minimum of Rs. 10,000 which may extend to Rs.1,00,000. My Vendor is asking me NOT to deduct TDS on his/her payment as they are exempt. What should I do? My Vendor whom I deducted TDS is asking me to provide TDS Certificate / Form 16A. What do I do? (b) Form 16A : is issued all non-salary related deductions. This is most relevant to Apartment Associations. To get Form 16A: Its best to take professional help to obtain the same. If your auditor has filed your TDS returns, usually s/he will provide the same to you. Please ensure you have obtained them and mailed / distributed the same to your vendors every quarter. If you are self-service oriented: Login to Government’s TRACES (TDS Reconciliation Analysis and Correction Enabling System) You may have to register as a new user if this is the first time your society is deducting TDS. Post that follow the steps on the TRACES system to download Form 16A. What are pre-requisites to deduct TDS? Apartment Association needs to have a TAN (Tax Deduction Account Number). It is 10 digit alpha numeric number required to be obtained by all entities who are responsible for deducting or collecting tax. It is mandatory to quote TAN allotted by the Income Tax Department on all TDS returns. The procedure for application of TAN is very simple and can be done online. Apply For TAN on NSDL Site. Does ApnaComplex Accounting handle TDS? (a) Capture PAN/TAN/TDS Rate for each vendor as part of master setup. (b) Record Vendor Bills and Advance Payments to Vendors along with TDS deducted. ApnaComplex will automatically calculate TDS for a given vendor’s bill based on the TDS rate configured. (e) Record the payments made to Government under TDS/Tax Payments section. (f) All necessary accounting entries are auto-magically taken care of by the platform. In addition, ApnaComplex has a strong eco-system of partners offering Accounting and Auditing Services to Housing Societies using ApnaComplex platform. You can reach out to us with your society details and we shall put you in touch with professionals you can ensure TDS compliance for your apartment association. ApnaComplex Gatekeeper shall now automatically call residents on IVR to seek approvals for visitors. IVR call is in an additional step on top of audio push notifications that ApnaComplex sends to residents when a visitor shows up at the Security gate. If the resident for any reason does not respond to the audio push notification, system will automatically initiate IVR calls to the registered mobile number of the residents. This eliminates the need for security to do manual verification of visitors by calling over intercom. This also reduces the overall efforts of security staff who other wise will have to call each resident over intercom to ascertain the visitor. Also the time spent by delivery personnel at the gate reduces as IVR is initiated in parallel for all flats s/he is going to visit and, which otherwise is a sequential process. Please reach out to us to enable IVR for your society. Collection Gateway is a unique solution offered by ApnaComplex to make a Housing Society collections 100% Cashless. Collection Gateway was launched in later part of 2015 and is now used by thousands of apartments every month to pay their maintenance and other dues to the society. In short Collection Gateway helps in reducing your society maintenance efforts and thus the Society Maintenance Charges. Best of all, Collection Gateway works with your existing Bank Account of the society and existing Bank Accounts of the Members. There is NO NEED to open a new Bank account – either by Society or by Members. Please refer to our Collection Gateway page for more details. Reach out to us to adopt Collection Gateway and save both Costs and Efforts. Raise GST Compliant Invoices on ApnaComplex! As GST rolls out in the country, all our customers can easily adopt and comply with the new tax norms with help of GST module on ApnaComplex. ApnaComplex is ready with the ability to raise Maintenance and other invoices on society members in formats specified by GST Act. All these reduce significant efforts in terms of complying with law. You can also record other financial transactions like non-member income and vendor bills to be able to easily generate necessary data for filing GST returns. As we get progressive clarity on returns and other information related to GST – we will continue to enhance the portal to make it easier for any society to comply with GST. 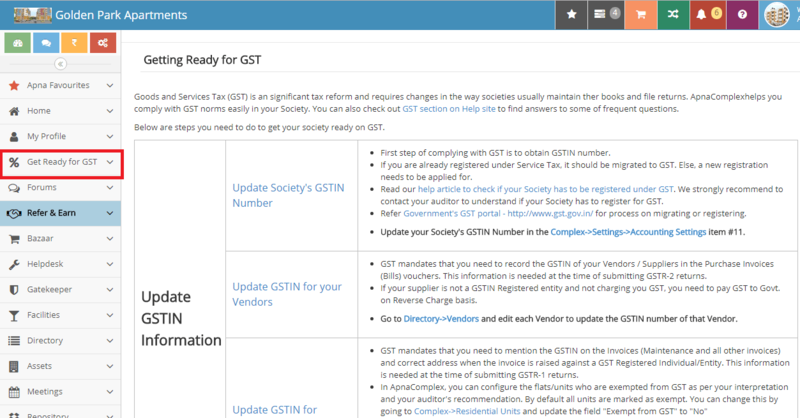 As you login into the portal, you can see “Get Ready with GST” menu item which will guide you step-by-step on getting started with GST (see screenshot). In case your society does not come under purview of GST, things are same as in the past. There is lots of debate among housing societies if they under purview of GST or not. Its best for committees to reach out to Auditors and follow their advice. (e) And any other combinations – ApnaComplex supports them! Co-operative Housing Societies are merely a collecting and pass through mechanism like in case of property tax, water charges, common area repairs and maintenance etc. It can be contended that no activity is carried out by a society for its members. There may be various service providers providing service to the society which is the legal owner of the building including that of common areas, for e.g. repairs service providers, maintenance service providers, security agencies etc. Thus, the society is receiver of service and not provider of service. If a member’s flat or office premises require repairs, the same is obtained directly by the member and the society is not involved in provision of that service. Further no consideration is flowing from the members to the society except allocation and collection of expense. Any such payments without quid-pro-quo of a service cannot be liable to tax. Thus, it can be argued that even under the new dispensation, service tax is not applicable in case of a co-operative society when any activity is carried out for no consideration and the same would be continued under the GST Act. Service tax on co-operative societies is a contentious issue. In a co-operative housing society, the land and building belongs to the society and the members by virtue of their membership of the society have right to occupy, enjoy and transfer their flats, subject to the prevailing rules and regulations and bye-laws of the society which are required to be approved by the specified authorities under the law. A co-operative housing society is a collective mechanism wherein it make payments of property tax and like payment to the municipal corporation and other Government bodies, incur some expense for common good and allocate and collect the expense in form of certain charges from the members on some basis or as per the resolutions passed in the General Body Meetings. Such collections are generally in the form of reimbursements. Some of the functions of a co-operative housing society are statutory functions like transfer of shares of the members with the underlined interest in the property (flats). It works on mutuality principles as the function of the society is for the members and by the members. Though it is not the objective, it is possible that at the end of a particular period, the society may generate some surplus which is used for members in future. In case of deficit, the same is made good by contributions from its members. However, such surplus or deficit cannot be said to be consideration for providing any service. Collection of property tax is statutory levy by a municipal corporation or a local authority under the Constitution of India. A society is a mere collecting agent and pays the same to the authority. There is no element of service in it. Even assuming it as a service, it is not provided for a consideration. Hence service tax is not leviable. As an abundant caution, the society should ensure that the amount collected from the members does not exceed the actual amount. Same taxability would be continued under the GST Act. ‘Maintenance’ as the name suggest is the amount collectively reimbursed to the society to upkeep and maintain the building and premises on regular basis. The members of the society pay maintenance charges on some predetermined basis as decided in the General Body Meeting. Electricity charges for common areas, watchman or security charges and other miscellaneous expenses incurred by the society including accounting, audit etc. is part of maintenance charges. Service tax may be applicable on this. If the actual service provider in relation to any input service, charges service tax in his bill, the society would be eligible to take CENVAT credit of the same and the same taxability would be continued under the GST Act. Car parking is in relation to regulate the parking place between the members and providing of space by use of vacant land belonging to the society for a consideration. There is an element of service in it and thus service tax may be leviable and the same taxability would be continued under the GST Act. Water is “goods” under the Sales of Goods Act, 1935. However, the society is not selling the water to its members. It is just providing the pipeline to deliver water in the members’ premises. So long as it is collecting actual amounts as charged by the municipal corporation, there may not be any consideration. Therefore, charges recovered from members on actual basis are not liable to service tax. In the event of collection of water charges exceeding the payments, only such extra amount can be chargeable to service tax. In relation to water for common use like swimming pool, garden, club house etc., it is advisable to have separate meter and separate collection from the members. Such charges for use of water for common purpose may be liable to service tax and the same taxability would be continued under the GST Act. These are specific services by the society to the member opting for such facilities. Any consideration paid for this would be liable to service tax and the same taxability would be continued under the GST Act. Share transfer fees are the amount charged by the society for transfer of shares when a member approaches for its consent for transfer of his flat. It falls within the definition of service as a consideration for an activity carried out for the member for transfer of his lat. There is an element of service in it and service tax may be leviable on the same and the same taxability would be continued under the GST Act. It is a fund which is collected by the members of the society to set aside money over a time of period to meet the eventuality of reconstruction of the building. It is obligatory for a housing society to collect Sinking Fund under the Maharashtra Co-operative Societies Act, 1960 and rules made thereunder. The fund collected from a member is transferred to new member if the original member ceases to be a member. No definite service or contractual obligation is involved so far as collection of sinking fund is concerned. It’s a mere collection from the members of the society. Like sinking fund, this is also a mere collection to meet eventuality of major repair expenditure in future. There is no promise to provide a definite service with any identified time frame. No expense is also identified. It is also not sure that a member from whom the repair fund is collected would be a receiver of service at the time when it is actually provided. The agreement to provide service to the member is absent. However, as an abundant caution, the society should bring out this candidly in the resolution pertaining to collection of repair fund to avoid any ambiguity. Non occupancy charges are charges levied by a housing society only when a flat or unit is let out by its members. A unit in a co-operative Housing Society is for occupation and enjoyment of its members. The permission of the society is necessary when the unit is let out. The society may accord its permission in accordance with the provision of its bye-laws and on payment of some periodical charge. Such charge is a consideration for agreeing to let out its premises and may be liable to service tax. Thus any consideration for allowing a member to let out his premises may be liable to service tax under the relevant clause of the Finance Act, 1994 and the same taxability would be continued under the GST Act. In terms of above discussion, all the charges upon which service tax is leviable if it exceeds the limit of Rs. 5,000 p.m. per member in a housing society. If a person owns two flats, for all practical purpose it would be considered as two members. The exemption would be accordingly computed and then the remaining would be liable to service tax and the same taxability would be continued under the GST Act. As per existing Tax structure currently service tax is charged @ 15% & whereas as per proposed GST tax @ 18% will be charged on Supply of Services but in existing tax structure assesses is not able to take the input tax credit benefit of goods & services whereas in proposed GST system assesses will be able to take credit of supply of both goods & services which will cover difference of additional 3% GST on Co-operative Housing Societies up to a level. However, the exact rates applicable to particular goods and services have not been yet finalized for GST on Co-operative Housing Societies. In case of a housing society or residential complex, the exemption is limited to 5,000 p.m. per member for sourcing of goods or services from a third person for the common use of its members. Total Maintenance Recovery from members of the Society is less than 20 Lakhs per Annum. RWA / Housing societies will need to charge 18% GST to its members if maintenance recovery is more than Rs.5,000/- per month per member AND if total maintenance recovery by the society exceeds Rs. 20 lakhs per annum. Accordingly, societies who fulfill either of the conditions will need to register under GST and charge 18% on their collections from Members from July 1st on wards. Please note that the Rs. 5,000/- per member per month exemption was available in the Service Tax regime as well and is being continued under GST regime. GST needs to be levied only if monthly maintenance per member crosses Rs. 5,000/- and annual collection is more than 20 Lakhs. This blog post is updated accordingly. ApnaComplex strongly recommends Housing Societies to talk to their respective auditors and get professional advice to understand the actual impact for your Society and if you need to register for GST. Disclaimer: This information is offered as a public service. While we try to make it accurate as possible as on the date of publication, the laws change and more importantly the way we interpret laws could also change. We cannot promise that this information is always up-to-date and correct. We strongly recommend you to consult appropriate professional advisers to understand the actual impact for your society. We are not responsible for any actions or non-actions that are done by you based on the information present in this article or any other article on this blog.